After identifying $11 million in otherwise sunsetting County funds, One LA-IAF leaders testified to the Board of Supervisors about their year long enrollment effort and the the gaps that remain even after the implementation of the Affordable Care Act -- gaps that will have serious consequences for families throughout the county. They demanded that the $11M be used to help cover the remaining uninsured in LA County. 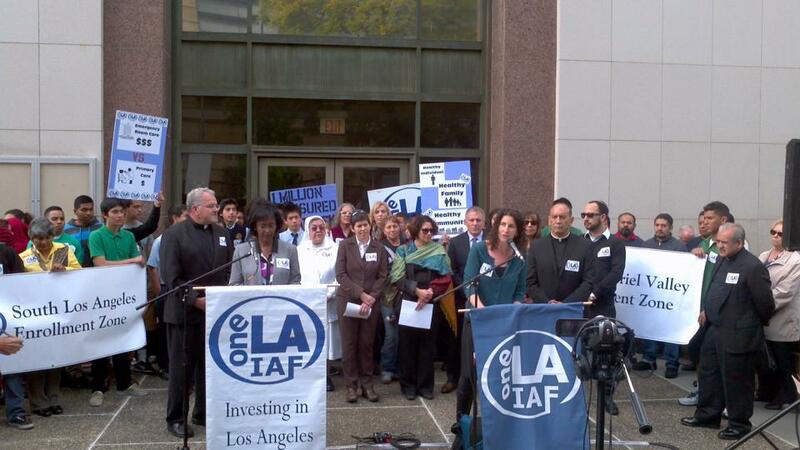 After the press conference, Rabbi Dara Frimmer asserted that she was "proud to stand with OneLA leaders outside the county supervisors meeting because as of today, 1 million residents of LA remain uninsured...Time to ensure that the image of God, imprinted on the face of every human being, is lifted up."